Ultra New hubs look much like their predecessors. In fact, the hub shells have not changed at all. They remain 6061 T6 forged and machined aluminum alloy with medium-height flanges. What's Ultra New about these hubs are their guts. Ultra New hubs use hollow axles of Surly's own design mated to thread in wheel fixing bolts, as opposed to the nutted axles of Surly's previous hubs. Hollow axles make conversion to quick release super easy (remove bolts, insert QR skewer, install wheel into frame or fork, ride). All Ultra New hubs come with fixing bolts, but all are QR compatible without axle conversion or any other extra bits. Neato. The axles are made of CroMoly steel, while the fixing bolts are 10.9 stainless steel (i.e. high grade) for corrosion resistance, high strength, and good looks, and the bolts tighten and loosen with a 6mm hex wrench. Bolt caps and 'cone' nuts are also stainless steel, and are heavily knurled for good bite, reducing the chance for your wheel to slip in the frame under high load. The cones and dust caps interlock to maintain axle stiffness. Ultra New hubs spin on non-adjustable 6901 model bearings. Throw your wheel on the bike, tighten the bolts and ride. One other thing you might like to know: All the Ultra New hardware will retrofit to New hubs. 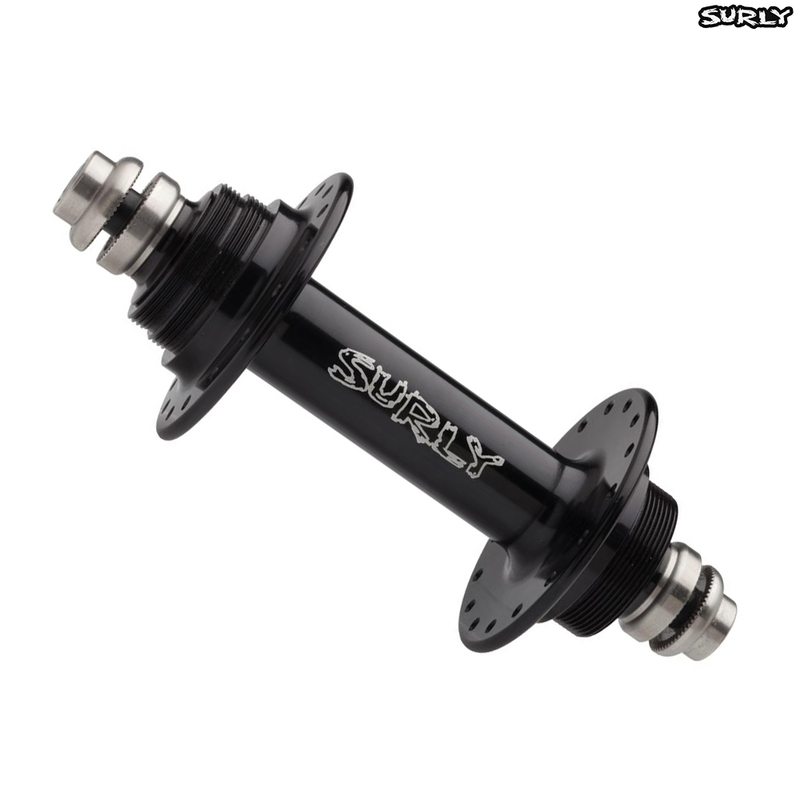 That is, Surly sell kits to completely transform your old New hubs into Ultra New hubs, complete with new axle, bolts, bearings, and the rest of the Ultra New hardware. Find the right kit for your New hub, install, and go. Could you build one of these hubs into a wheel for me? Any idea of how much? Yes we can of course build this up into a wheel for you. The price will vary depending on what rim you want to go for and what type/colour of spokes. You can order a full custom built through the website by adding this hub, the rim of your choice and one of our "wheel build" options (making sure to match up the correct spoke numbers) to your basket.